I made my way out to the garage this morning to get the shovel and snowblower out to start clearing the 12 inches of snow left by last night's storm. 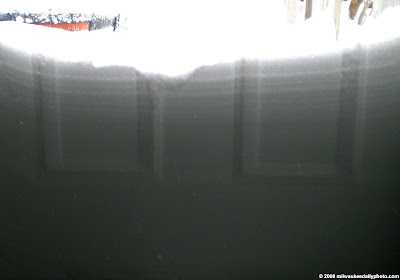 After getting inside, I noticed that the snow had compacted into the face of the door and left an image of the panels. The light shining through the top layers of snow adds to the interest of this photo.